In the UK, the cost of electricity is 10-15p/kWh and the cost of gas is just 3.5-4p/kWh. Therefore, on the face of it, heating with electricity is considerably more expensive than heating with mains gas (e.g. a boiler). How much do we spend heating an average sized home with gas? An average energy bill in a gas central heated home is approximately £1300, of which 70% is gas and the remainder is electricity. Of the 70% gas, 85% of this is for heating with the remainder hot water – that means that approximately £775 goes towards heating (£1300 x 0.7 x 0.85). So gas is cheaper, but is heating with electricity really that expensive? There are three things to consider when you are heating your home with electric radiators/storage heaters/infrared heaters (which all run off electricity). The first is the size of the system you install; obviously a higher rated unit (normally measured in Watts) will use more electricity if it is switched on than a lower rated unit. Say for example you were on an electricity tariff that charges 12.5 pence for each kWh used (i.e. 12.5p / kWh). If a 200w electric radiator is on for 5 hours that will use 1kWh of electricity – so will cost 12.5 pence to run. (That is simply 0.2kW x 5 hours = 1kWh). If a 1000w electric radiator is on for 5 hours it will use 5kWh of electricity – so will cost 62.5 pence to run (1kW x 5 hours = 5kWh). Now, a larger room is going to need more heat compared to a smaller room, so obviously you will need either multiple smaller rated heaters or one large rated heater. The effect will be the same though; a big room will cost more to heat. The second thing that is going to impact the electric heating cost is the length of time that you keep your heating on for. 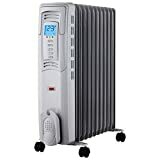 Take for example the 1000W electric heater we described above. If left on for 1 hour, it would cost 12.5 pence, but if left on for 10 hours, you are looking at £1.25. This therefore depends on your behaviour; if you are spending more time at home and you require heating during these times then it is going to cost you more to heat your home with electricity (as it would with gas). The final piece of the puzzle is the temperature to which you heat your home. If you have some sort of thermostatic control in your home, this will send a signal to the to the heater to switch off when the set temperature is reached. A lower thermostatic temperature will mean that your electric radiator is on for less time because the radiator has to work less hard to get the room up to temperature. So even if you set your radiator to be on for 10 hours during a day, it might only actually be pulling electricity for 4 hours for example. The rate at which the heating system will warm up a room is dependent on how well insulated the room is. Well we need to produce an example to see how all of this feeds in to our calculations. An average house is defined by the Government as being 97m2, consisting of 3 bedrooms, a lounge and kitchen diner. So in this situation you are looking at heating the 3 bedrooms, the lounge and the kitchen as well as most likely a couple of bathrooms. How much would this cost to heat use electricity? Trying to keep it relatively simple, we are going to use the example of electric radiators. These convert 100% electricity to heat (unlike gas boilers that would only covert each unit of gas into 80-90% heat). On average to keep a room warm you should be looking at using about 150w for each m2 of floor space – an average home therefore would require 97m2 x 150w to keep it warm – so approximately 14,450 watts or 14.45kW of electricity. A really well insulated home would need less than this and an older uninsulated home would require additional heat – perhaps as much as 200w per m2. 14.45kW x 24 hours x £0.125 / kWh = £43 per day. £43 x 365 days = £15,695 to heat your home every year. That obviously seems ludicrously high, but lets start stripping the number down and see how it compares to heating your home with gas. Most of us only have the heating on during the cooler months – say for example from October 1st to March 31st. That is 6 months, so that means straight away we have made an almost £8,000 saving. Then we need to consider how much we heat the home – so which hours the heating is on. For most of us, we like the home to be warm when we wake up – so maybe for 2 hours in the morning, and then a few hours in the evening, so from 5-10pm. That means instead of heating for 24 hours a day, instead we are only heating for 7 hours a day. This seems a bit more reasonable, but we have clearly assumed that when a radiator is switched on, it is providing heat even if the thermostat is telling it not too. We have also assumed that all the rooms are heated at the same time for the same length of time. So firstly lets consider this 14.45kW number – if we divide that by 2, you suddenly have an upstairs heat demand and a downstairs heat demand. Upstairs tends to have bedrooms and so is heated for maybe an hour when you wake up and just the hour or two before you go to bed to make sure the edge is taken off. The downstairs calculation is different again. Firstly I have split the downstairs heat demand into 2 – half for the lounge and the other half for the kitchen. The lounge tends to be on for in the evening when the TV is on so for 5 hours in our simplified example but not on in the evening, but the kitchen tends to be only on for an hour or so, while cooking is taking place – then the oven starts taking over and heating the home, as well as steam from boiling pots and pans. £325 + £405 + £80 = £810. So, while gas is is definitely cheaper, with the lifestyle considerations we have discussed above, electricity can be affordable too – you just need to make sure to install the right heating controls. This is probably one of the best articles out there. I’m moving into my first flat in August which is electric heating only, I’ve been so worried about the possibility of near bankruptcy but it just goes to show that if you’re sensible and heat the right amount for the right amount of time, there is no reason for it to costs £1000s. Thank you so much! An interesting take on the gas/electric quandry. Because of of huge power stations burning gas to make electricity with all the burning and exhaust losses(&Co2) concentrated in one place, then incurring huge I2R losses in transmission at death defying voltages over a hugely expensive grid you get elec 3x gas in the home. The real solution to this is to use gas in the home to power a tiny gas turbine to generate elec at sub-50v. A water jacket on the turbine would heat the home and probably charge your electric car. No grid, no cable losses, magic. Why don’t we have it already? Too much vested interest and money(yours) at stake. At 50v domestic you could do your own wiring and repairs. nobody would get fried. Oops another huge industry and cost for consumers gone. If turbines are too scifi for you the Victorians, of course, had gas engines which ran some factories as an alternative to steam. Things are the way they are becase things are the way they are! If you have solar panels fitted wouldn’t this make electric heating a cheaper option? In principle solar panels would certainly make electric heating cheaper since you are generating free electricity. I guess the only thing to consider though is that solar panels produce most of the their electricity during April – October. Typically, people don’t have their heating on during the summer months. Likewise, people tend to put their heating on in the evening – and for solar to produce electricity the sun needs to be shinning. So while solar does in theory make electric heating cheaper in reality it doesn’t help that much unless you have your heating on all day and all year round! Yes it seems amazing that electricity is 3 times dearer per Kwh than gas, yet the author claims the overall cost is near the same? There isn’t enough detail in this article to justify that assertion. The price to heat your home with only electricity is absolutely extortionate. I live in a 3 bed bungalow (originally 2) with heating supplied by electric warm air heating and the bedroom extension supplied with an electric wall mounted heater. We have to charge the heating up at night (usually twice a week) and release during the morning for an hour and evening for 3 hours at 11 degrees: This is usually from late October to mid-April. The cost at this time is around £180 a month and drops to £60 a month from mid – April to late October. As you can see the heating during winter is unacceptably high and most of the time we are still freezing, however no help is forthcoming for grants/funding for alternative heating systems; yes we own our home (paying mortgage) but are on a low income and struggle to pay for our heating costs. Energy companies are a rip off and do not care about how a family is affected by decisions on ‘eating’ or ‘heating’. I have electric warm air heating. Just wondered if you’re still using it as I’m looking at maybe replacing mine. I’d say your home is either poorly insulated or your heating system needs upgrading. We have a similar size all electric home and even in the depths of winter our bills come in at no more than £120 p/m and that’s with me having the heating so high that its warm enough to happily sit around in light pj’s or even shorts which I like to do in the evenings. You need to compare like with like. If you make the same assumptions for gas – about how much you have the heating on – and replace the 0.125 price for electricity in the calculations with 0.035 price for gas then you get £91 + £113 + £23 = £227. Plus add on 10% or so because the efficiency is not 100%. Still much cheaper than electricity. I’ll say do the same calculation and REDUCE the amount by 5% all newer boilers must be condensing type with an efficiency close to 110% (related to LHV) so the price is lower (but also add about 100£/year of maintence). A viable alternative for whom who cant rely on gas is heat-pump. A solution that for a kw/h of thermal power needs only about 1/3kwh of electric power. Your explanation is well written and your conclusion is pretty much as I had expected,however,you haven’t mentioned the additional cost of servicing these modern boilers that give 80% efficiency (If they are under full load). The reality is that using gas will add at least a further £100 per year for servicing alone. Given the mechanics involved in the system,breakdown are more likely and costly. Had you considered the installation cost of each system?